In the book "MRI of the hip", we endeavoured to cover almost all pathologic entities, with an emphasis on those related to sports injuries. Without the invaluable contribution of colleagues who authored the chapters on topics of their expertise this project would not be possible. In all chapters, clinical aspects, schematic drawings and a wealth of images are aiming at helping the reader to understand the content. Individual chapters address specific topics. Therefore, it is not necessary to start reading with page one. In the last two decades, joint preserving surgery of the hip, in particular the treatment of femoroacetabular impingement, made an enormous progress. Not least, precisely performed radiographic imaging contributed to a differentiated assessment of the pathomorphologies of the hip. Although radiographic diagnostics can be regarded as the foundation in the imaging of pathologies of the hip joint, MRI led to a paradigmatic change. The imaging of joint cartilage and surrounding soft tissues enabled to decode the pathogenesis of relevant disorders. 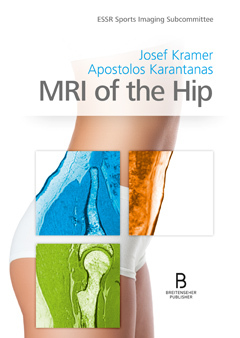 By now, magnetic resonance imaging has become an indispensable keystone in hip preservation surgery. As an orthopaedic surgeon dealing with all the entities presented in this book, I found myself reading chapter by chapter with pure pleasure. The reasoned chapters are tailor- made for the clinical practise, providing an introduction to the specific pathology, presenting the anatomy and characterising radiographic findings and features in MRI. Furthermore, from an orthopaedic point of view, the current state of research is reflected by the references of highly regarded protagonists in hip surgery. The book is loaded with numerous MRI figures and schematic drawings, illustrating the respective pathology perfectly. This book is intended for both radiologists and orthopaedic specialists: The radiologist will appreciate the etiopathological, anatomical and clinical background of the presented disorders. And the orthopaedic specialist with preknowledge in the analysis of radiographs will be able to interpret the imaging of the hip joint comprehensively.